Kony Solutions and the Kony Mobile Application Platform(tm) enable Fortune 500 companies to offer consumers and employees feature-rich mobile applications in less time and at lower costs than any other solution. Leveraging a Write Once, Run Everywhere single application definition, applications are designed and developed just once, in a device-independent manner, and deployed across multiple channels, including native applications, device-optimized mobile web, SMS, web gadgets, desktop applications, and tablets. 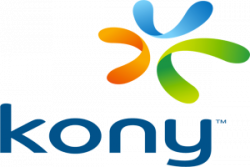 Kony's unique platform is proven to future-proof a company's mobile investment by enabling applications to be changed once for all channels, ensuring faster adoption of new operating systems and standards as they are introduced, while eliminating maintenance, upgrade and future development costs.